When you open a scene coming from Harmony Premium, it may contain multiple Display nodes allowing you to see isolated portions of the scene. The Display node is an important node; it is used by the export and views to display your scene, primarily the Camera and Timeline views. 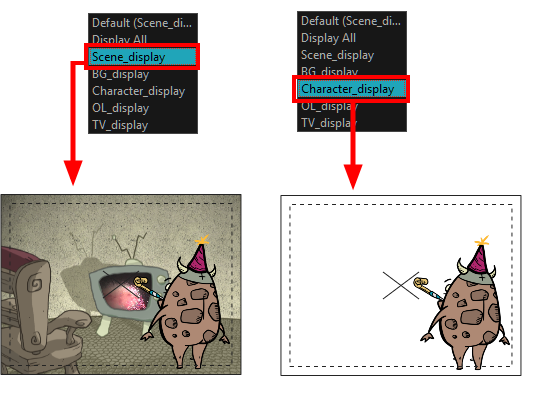 By default, a scene's node system always has a Display node which can be used to show your entire scene, a single node or a group of nodes through a Composite or Group node. You might use it to see one single character as you animate it, debug your node system as you create complex effects or export your complete scene or a portion of it. ‣ From the top menu, select Scene > Default Display > desired display. Each view is updated if set to the Default display option.